We like simple projects that we can give as a gift or that we will use at home. We also like to try to keep in mind choosing projects that are toxin free when possible. Years ago I had my first love of natural dye while reading an article about dying Easter eggs with food like turmeric and onions. I wondered if it would work on fabric too. Then I read a blog post about shibori. I was immediately inspired. I fell in love with the deep rich blue color. And how simple it seemed. And loved that the dye worked best with natural fibers (cotton and linen) and that the dye was natural using the pigment -indigo. Then for a fun get together with friends, I had a shibori party. Everyone brought something to dye. We all took turns folding our item and dipping it in the indigo dye. The designs were amazing. I became obsessed with this maker who naturally dyes everything with things she forages. I want to get her new book, “Botanical Color at your Fingertips”. Fast forward I am watching Chef’s Table on Netflix. (If you haven’t watched it yet you have to!). The episode about Blue Hill Farms is on and the chef has an indigo blue dish towel tossed over his shoulder in the kitchen. I immediately went online to see if they were on sell on his website. No. I kept it simple, limited it to solid indigo using 100% cotton dish towels like the ones from Blue Hill. And using the shibori-itajime technique. Another reason to love this project, you don’t need that many tools. For the patterned pieces we used a shibori technique called itajime. Shibori is a Japanese word that means to wring, press or squeeze/manipulate your fabric before dying. Your creativity, rubber bands and wood squares was all that was needed for this. Since this was our first time dying we wanted to make it easy on ourselves so we ordered a kit that pretty much included everything you needed (see link below). Start by pre-washing your fabric in hot water. This will make them more absorbent to the indigo dye. Next make the dye bath. 4 gallons warm tap water. Add in indigo dye, soda ash and hydrosulfate (comes with the kit). Stir until dissolved. Stir in one direction and then the opposite direction. Then put the lid on for about a half hour to let the color develop. Next is the creative part: folding your towel in all the unique designs. We chose to do shibori- itajime. There are many different ways to create your folds. Here is one in this link. We used it as a meditative experience, getting lost in the preciseness of different folds and enjoying the process instead of focusing on perfection of design or outcome. Shibori-Itajime: fold your towel into a tiny square and put between two pieces of wood and use the rubber bands to hold it in place. Dip it in water. Put pressure on the wood slightly to “wring”. Then with gloved hands, hold in the dye, avoiding touching the bottom of the bucket. We let it sit in the dye for 2-4 minutes and then laid it on the floor and waited 20 minutes for the color to develop. You can repeat this to develop deeper color or remove the rubber bands and wood blocks and rinse. It is a good idea to re-dip a few times otherwise the color is subtle. We love the intensity of a deep rich vibrant blue. Solid: submerge the towel for a minute or 2. You can re-dip for more saturated color. Ombre: Wet your towel. Hold one end of the towel in the pot and let the color absorb. Once we were done with dying we washed in cold water and dried as normal. Made a few of the towels some for home and then made several for friends as gifts. Such a fun creative process. 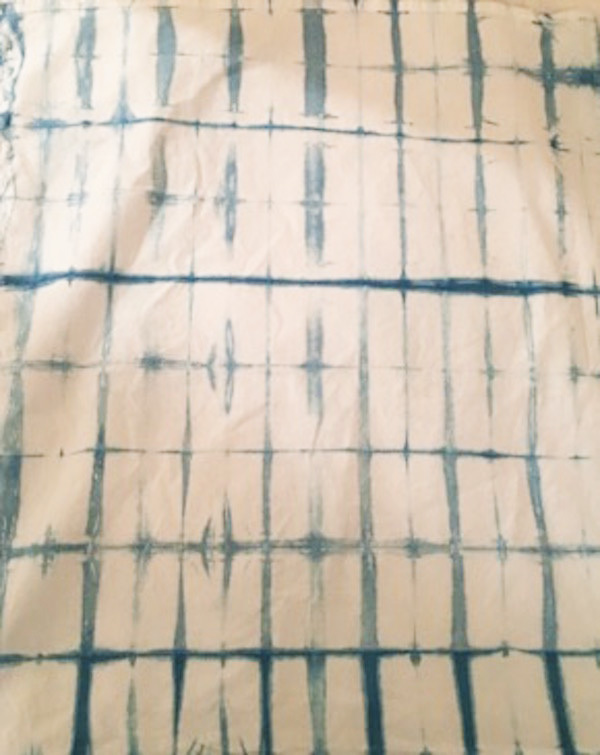 Our next shibori-itajime project we plan to dye linen to make a fun kimono for spring. Blue Hill Farms inspired indigo blue dish towel dyed by us!